Online dietary assessment tools offer a convenient, low cost alternative to traditional dietary assessment methods such as weighed records and face-to-face interviewer-led 24-h recalls. INTAKE24 is an online multiple pass 24-h recall tool developed for use with 11–24 year-old. The aim of the study was to undertake a comparison of INTAKE24 (the test method) with interviewer-led multiple pass 24-h recalls (the comparison method) in 180 people aged 11–24 years. Each participant completed both an INTAKE24 24-h recall and an interviewer-led 24-h recall on the same day on four occasions over a one-month period. The daily energy and nutrient intakes reported in INTAKE24 were compared to those reported in the interviewer-led recall. Mean intakes reported using INTAKE24 were similar to the intakes reported in the interviewer-led recall for energy and macronutrients. INTAKE24 was found to underestimate energy intake by 1% on average compared to the interviewer-led recall with the limits of agreement ranging from minus 49% to plus 93%. Mean intakes of all macronutrients and micronutrients (except non-milk extrinsic sugars) were within 4% of the interviewer-led recall. 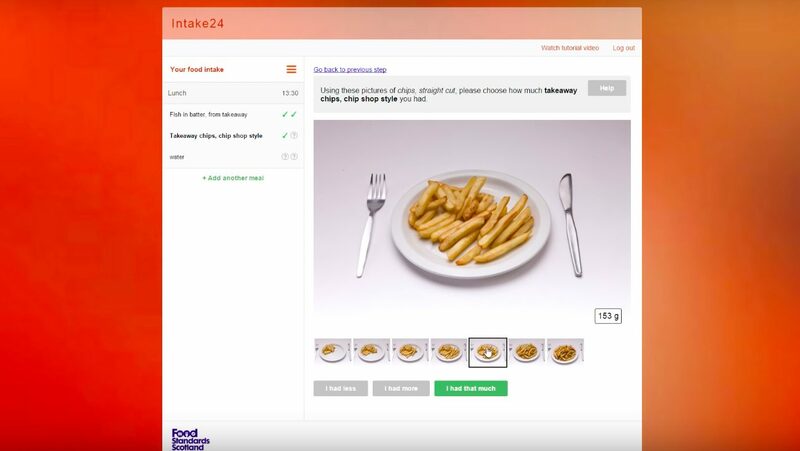 Dietary assessment that utilises technology may offer a viable alternative and be more engaging than paper based methods, particularly for children and young adults.